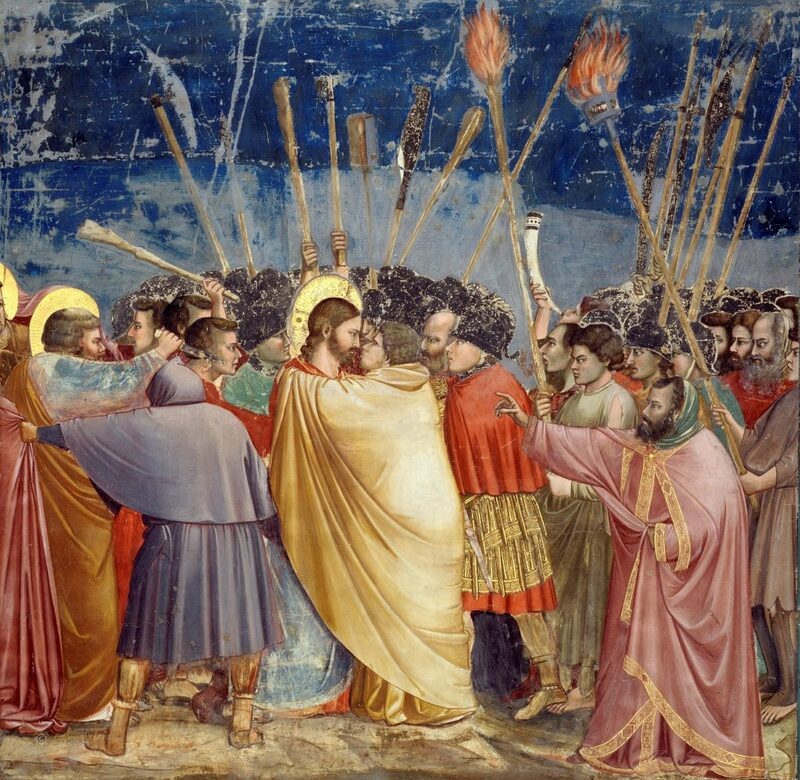 ONE OF THE FASCINATING FIGURES OF HOLY WEEK is Judas Iscariot, shown here kissing Jesus in the famous painting by Giotto; if you are able to get to Mass in the first part of Holy Week you will notice that on two of the days the narrative of his betrayal of Jesus is played out. In some Christian traditions he occupies a place of singular infamy; others are more understanding and forgiving. The recent novel Judas by the celebrated Israeli novelist Amoz Oz looks at the figure of Judas from the point of view of contemporary Judaism and links him to reflection about the idea of betrayal in the early history of the state of Israel. In Holy Week Judas serves partly to remind all of us of our sinfulness – he’s not a uniquely wicked figure. We are all capable of betraying Jesus, so his example can help us in our examination of conscience as we go to Confession at this time of year. He’s not inherently evil, any more than the rest of us – we’re told that Satan enters his heart. Like all of us, Judas has free will, the capacity to make a free choice between right and wrong, between good and evil, between light and darkness. In chapter 13 of John’s gospel, after we’re told that Judas leaves the Last Supper to go and betray Jesus to the High Priest, the menacing words appear: ‘Night had fallen’. The evangelist isn’t simply telling us what time of the evening it is; rather, it is also symbolic. The betrayal marks the beginning of the reign of darkness, of night, which will come to end in the holy night of Easter when the Lord rises from the dead. In our personal lives perhaps we can think of periods when there has been darkness; when, possibly because we or others have made bad choices, sin and disorder has held sway in what we have done, periods when ‘night had fallen.’ We might even be able to relate such periods to time when we have suffered from depression or similar conditions (which, I hasten to add, are not the result of bad choices). The effort we make at this time of year to look honestly at our lives and seek God’s forgiveness can offer us a way out of this phase of darkness – if we trust in God’s grace. When we go to confession we acknowledge our radical dependency as human beings: dependence on God, and dependence on the Church in the person of the priest. This need for others is what sets Christianity apart in a culture dominated by individualism and selfishness, on false notions of self-reliance. Being aware of sin is about acknowledging the existence of evil. We can follow the path of evil if, like Judas Iscariot, we make bad choices: but this is not restricted to our personal lives. In many ways in this country the time we’re living in is characterised by darkness, by night. Divisiveness, increase in hate crimes, worsening untruthfulness, inflammatory language, contempt for the poor whom God loves, the false message of nationalism, even mental health problems arising from all this – these are manifestations of real moral evil, the work of Satan. In Holy Week, as we ponder the tragic and flawed figure of Judas, we can grow in our awareness of the presence of evil. If we laugh all this off, if we fail to exercise real discernment, then evil has won a battle in our hearts. Holy Week is a serious time, when we can face up to some harsh truths. But it ends in triumph. Not only do we hold that Jesus rose from the dead on the first Easter day, we believe that his death itself which we will mark on Good Friday is itself a triumph. 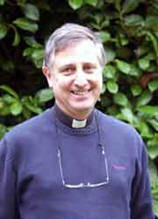 Evil, the power of Satan who enters Judas, is vanquished by the Cross. We’re clearer about this in our sacred liturgy than in the past: it’s why today on Palm Sunday and on Friday we wear red vestments: we’re not in mourning, we’re celebrating a triumph through the blood of Jesus shed on the Cross. This is why in the midst of sinfulness and signs of evil, Holy Week is a time of hope. I like to think that there was hope in the end even for Judas.